-he's getting too old and smelly. - we're getting a new carpet. Imagine the world if we could just chuck old Aunt Aggie out in the street because she's getting a bit senile in her old age. Maybe that is the way we are heading because ask any dog shelter worker and they will tell you the problem of abandoned pets is one that is getting worse not better. According to the Humane Society of the United States between 6 and 8 million lost, abandoned and neglected cats and dogs enter shelters in the States every year. 3 to 4 million of these animals are euthanised every year. That is one every 9 seconds! Not all dogs in shelters and rescues have been thrown in the street of course. Many are truly lost. In the US only 16% of dogs in shelters will be reunited with their families. Consider that only one in three dogs will be lucky enough find home that lasts its lifetime and the need for caring shelters is all too clear. Spay and Neuter - by far the largest cause of the millions of unwanted animals in shelters today is overpopulation. 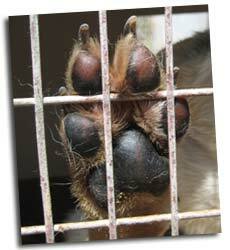 Adopt from a Shelter - Don't buy your next pup from a pet shop or a puppy mill. Consider adopting from a shelter or rescue. Foster a Dog - Shelters and Rescues quickly become full to bursting. No-kill facilities either have to refuse to admit any more dogs or they have to work with fosters. While becoming a foster is not easy - every shelter will careful vet any volunteer fosters - and can be emotionally very upsetting, fosters are unsung heroes of the animal rescue movement. Volunteer - Most shelters are running on a next to non-existent budget. Volunteering your time to help out, cleaning kennels, walking dogs etc., is always going to be a very welcome way to help. Donate - You do not have to be wealthy to help out your local shelter. Even dropping off old blankets and towles would be one way to afford a few dogs some extra comfort. A local shelter I know was telling me that it is often the most basic items that are needed. Bleach for cleaning and disinfecting, for example. Also consider that if you are a business owner, helping out your local animal shelters is quite probably tax deductable. Also as a business owner you can offer services instead of cash. Printing, donate you old computers, printers, offer to pay for an ADSL line, etc. Educate - help get the word out about the tragic situation of all the unwanted dogs that there are even in your own area. Read Interview at the Dog Pound and pass it on.